‘It can be a string of shells, or a bundle of special cloth. Nowadays it’s likely to be a row of ones and noughts in a computer somewhere’. 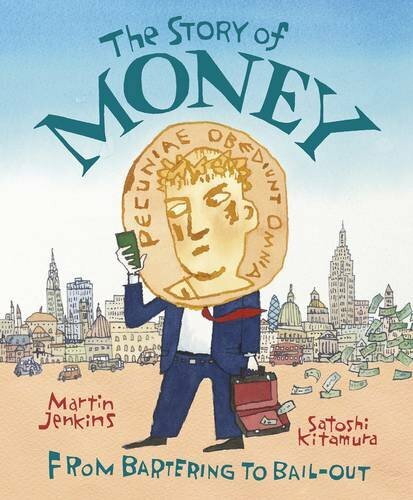 This most engrossing and original book asks the question : why, when human beings managed without it for a very long time, was there a need to invent money? The sixteen chapters answer this question and explore the history of money beginning with bartering. They go on to describe how clay tablets were used to acknowledge a debt and how precious, and later base, metals were used to make coins to store value and made trading easier. Difficult concepts like ‘interest’ , ‘taxes’, ‘inflation’, ‘ currency exchange rates’ and the functions of banks are all clearly explained. Why is this book particularly welcome? Well- peruse the non fiction shelves of a children’s bookshop and you will find many books are organised round multimodal double spreads which combine a collage of drawings, pictures, cartoons and shortish blocks of writing. Nothing wrong with this approach : in fact a medley of pictures and writing can work well to make meaning and capture interest. However, older primary school pupils also need the challenge of books which present a sustained written explanation of new and difficult notions and which develop a coherent analysis. This book does this superbly well. The writing style is conversational but a huge amount of information is communicated – and in such an engaging and often witty way. Young readers are invited to reflect and join in the author’s speculations. Satoshi Kitamura’s illustrations clarify the narrative, help explain difficult notions and support the writer’s speculations in ways that are full of fun and humour. I particularly liked the illustration of the effect of inflation on the price of a chicken in ancient Rome. This author goes beyond the bare facts and his speculations to add a philosophical dimension to his analysis which will encourage young learners to ponder and discuss. He suggests that essential as money has become, necessary for trading and carrying on business, some valuable things cannot be bought . If people come to feel that all you need in life is a lot of money – ‘I don’t know what you think, but I don’t think that’s a very good thing at all’.